As a professor emeritus at Missouri State University, Debra McDowell teaches in the Merchandising and Fashion Design Department—and with Halloween on the horizon, she chats with us about all things fashion and a bit of costuming. Forgive Debra McDowell for not moving at the briskest of paces. The Missouri State professor recently had a rod and screws inserted into her right leg. The procedure resigned McDowell to a cane and, as a means of functionality above anything else, a dress-heavy wardrobe. But despite recent restrictions, she puts a lot of thought into what she wears. When we meet, she’s selected a flowing dress adorned with blues and magenta and a saintly pattern. 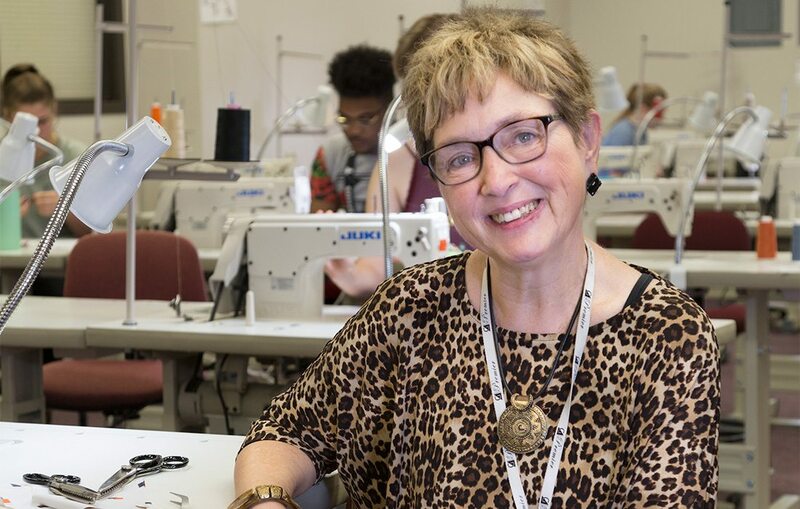 Despite retiring 10 years ago, McDowell is a professor emeritus at Missouri State where she teaches a beginning clothing construction class. Her emphasis is in historical fashion; she once worked for the National Park Service in conjunction with the bicentennial when she studied pioneer garments. When she was growing up, McDowell’s family formed a kind of production line every summer and made their own clothes. “We had a great wardrobe that people would ooh and ahh,” she says. 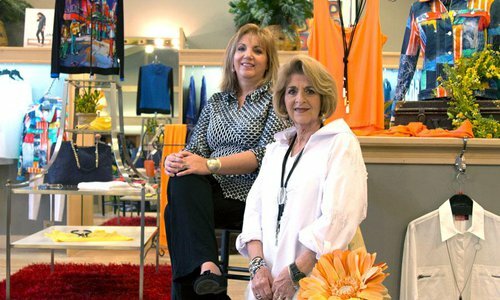 Prior to retirement, she taught for 30 years at Missouri State in the Merchandising and Fashion Design department. She even had a post-retirement stint at the University of Phoenix, where her students came to know her as Dr. Debra. “I figure if there can be a Dr. Phil, there can be a Dr. Debra,” she quips. Put a quarter in the jukebox and McDowell will give her take on concerns ranging from Elon Musk colonizing space—“What are you going to wear out there? It’s not going to be what we wear on Earth!”—to the work ethic, or lack thereof, of kids today. It’s the perspective of someone who has spent their life carefully observing a constantly evolving world before distilling their observations into a curriculum and a stringent set of principles. We caught up with McDowell to talk about her experience with costume design, the state of fashion and anything else she saw fit. 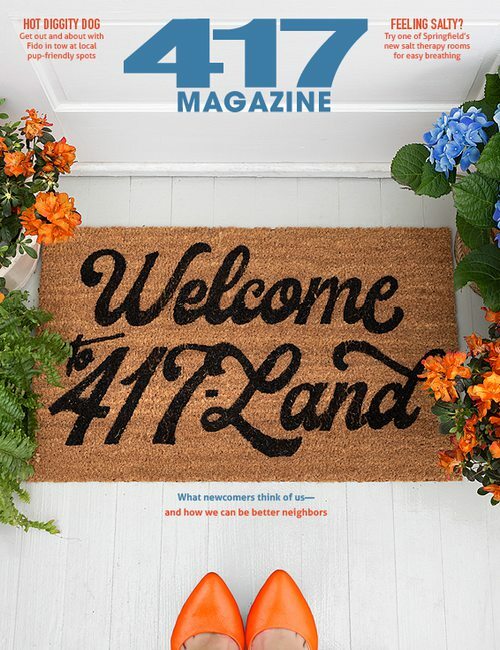 417 Magazine: Where does your interest in historical costumes come from? Debra McDowell: I’ve always loved history. I’m a huge history buff. And Eastern European history, that gets into the accords of Versailles and the monarchs of Britain and the czars. Even going back to Pharaoh during that same time, that was when the King Tut exhibit was around. That influenced even the look of cars. Designers were picking up on the look of the sarcophagus of King Tut. Vinyl roofs on cars and that gold and cobalt blue were everywhere, and so fashion is in everything. I love fashion because it’s a reflection of our society—the culture, the economics, the political world, it all influences fashion. It is the reflection of the times, literally. 417: What is something about fashion that you wish people knew? D.M. : Terminology. Don’t call fabric “material.” It drives me crazy. It’s fabric. Material can be nails and sandpaper and all sorts of things. Fabric is more specific. And don’t let yourself go. People tend to let themselves go, and they could look so much better if they would wear the right clothing that fits their body instead of their head and enhance their personality—be their own person. That’s one of my big things: Don’t follow the crowd; be your own person. 417: What mind-set does someone who sees the world through fashion usually have? D.M. : Analytical. I’m very critical. I’m into how does something fit? What’s the problem that your pants are too baggy? What’s the problem that stripes aren’t matching? What’s the issue with one shoulder being higher than another? How can we make that figure issue a plus? And so I’m always trying to figure out how to make something better. How does that fit better; how can you look better? 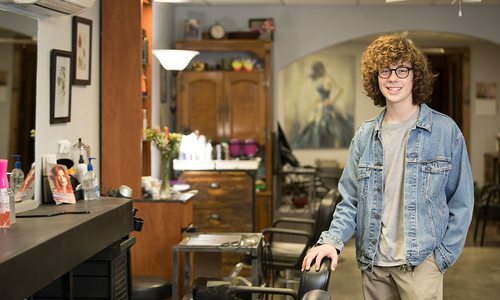 Can you enhance someone’s appearance? That’s self-esteem. That’s worth a million dollars. 417: How much of your studies is examining the psychology behind why people like what they like? D.M: A lot. The self-esteem aspect of it. Figuring out what you need to wear when you go for an interview. People make decisions about you within the first 6 to 7 seconds that they first meet you. You want to make sure you’re dressed appropriately for the job that you want to get. That is a huge issue when you’re making that first impression. Every year, I talk to [MSU] seniors about what they need to know and how people will perceive them. 417: What do you do for Halloween? It must be fun for someone with your background. D.M: I like to be creative. I did that with our children. Use a pillow case, put it over your head and you can strap your pants around and look like the dwarfs of Snow White. You don’t have to spend a lot of money. The In-House Boutique at Wickman's Garden Village offers a relaxed shopping experience with apparel, accessories and jewelry. 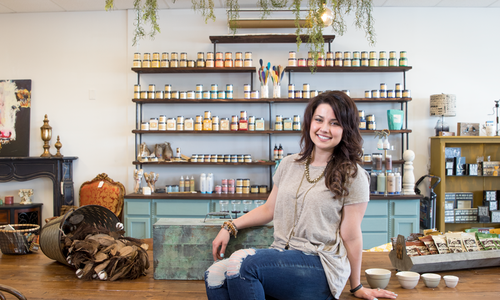 At Scuffed Edge in Republic, one creative maven shares her passion for refurbishing home decor.